Construction is now underway…as of mid-August, 2018 the first floor (of 4) has been built. One of the recommendations from the Avenue Road Avenue Study (2009) was the creation of “green-fingers” proposal to provide for landscaping and plantings at the entrances to our neighbourhoods wherever possible on branching streets east and west of Avenue Road. An opportunity existed for the creation of a green-finger at the corner of Brooke Avenue and Avenue Road. Brooke Avenue has an irregularly wider road width at the west side of Avenue Road. 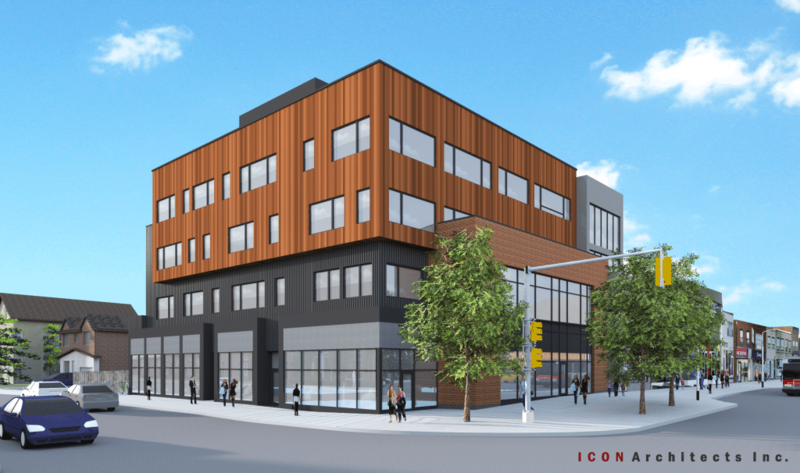 A 4-storey mid-rise commercial development at 1912-1914 Avenue Road on the northwest corner of Brooke Avenue was under review for site plan approval. This was an opportune time for the City to prepare for reconstruction to correct the Brooke Avenue alignment and in the process provide for the first green finger on the west side of Avenue Road. The Motion was approved by the North York Community Council (NYCC); considered by City Council on July 12, 2016. The original proposal at this site at the north-west corner of Avenue Road and Brooke Avenue was submitted in Oct, 2014. 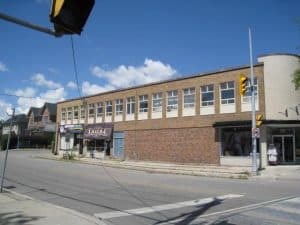 The application was for a 5-storey mixed-use commercial building, retail on the first floor and office space elsewhere. The Owner applied to the Committee of Adjustment (CofA) for 15 variances in Proposal #2. The building height was 19.2 metres plus another 4 metres for mechanical with no step-back on the side street. SAHRA decided to oppose Proposal #2 as it was then configured in order to uphold the Avenue Road Avenue Study and its associated by-laws, which were approved by City Council in 2009 after significant consultation between city planners, SAHRA, area residents and a Local Advisory Committee. SAHRA, the Old Orchard Grove Residents’ Association (OOGRA) and community members opposed the proposal at the CofA and the CofA refused the application on Aug 6, 2015. Following this, the developer submitted an appeal to the Ontario Municipal Board (OMB) and a hearing date was set for February 24, 2016. Councillor Carmichael Greb hosted a Community Meeting on Jan 20, 2016 at which it became clear that the revised Proposal #3 was not acceptable. SAHRA retained a planner and a lawyer to prepare for the OMB, and arranged Without Prejudice discussions with the owner’s team. These discussions have led to a Settlement between the owner and SAHRA. Based on the opinions of our lawyer and planner, we concluded certain items could not be successfully argued given the specific context of the proposal and the position taken by the City. Some matters require review of the By-laws and we will devote resources in the coming months to achieve long term resolutions. Given the changes we have been able to accomplish, it is unlikely a better result would occur if the matter was fought at the OMB. Therefore, SAHRA will appear in support of the Settlement. We hope you will see the logic in our decision and support SAHRA in this Settlement. The Committee of Adjustment refused the Proposal #2 after presentations by SAHRA, OOGRA and concerned community members. Step-back incorporated at the third storey on Avenue Road, at SAHRA’s request. Maximum building height reduced by 2.9m, now meeting the by-law of 16.5 metres (5 storeys reduced to 4) in Proposal #3.
submit a motion to request that any payment-in-lieu monies to make up for lack of parking supplied in this proposal or any other on the Upper Avenue (Lawrence to Wilson) be designated for parking solutions within that area. She also stated that the City would undertake reviews to define and then implement parking solutions for Avenue Road. support the rewording of an ambiguous by-law paragraph to ensure that step-backs be required on side streets as well as on Avenue Road. In Proposal #4, although the mechanical penthouse is still higher than the by-law limit, it has been set back from the edge of the building, making it less visible from the ground. 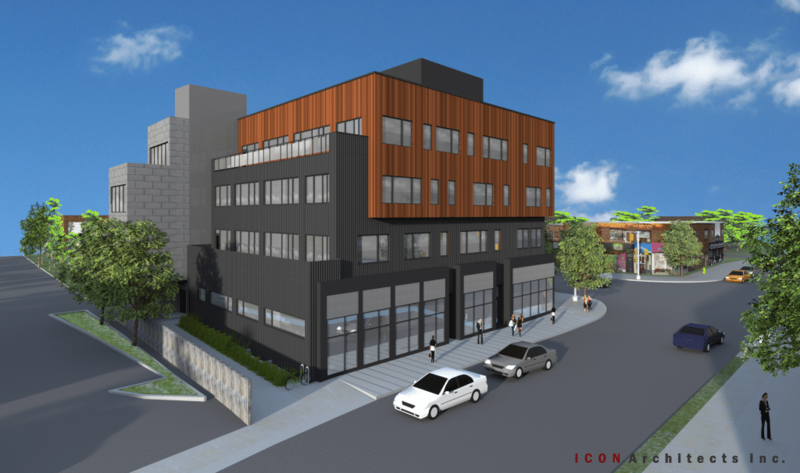 In Proposal #4, the design of the building facing Brooke Avenue has been improved. The ‘tower’ has been removed. A small step-back was created at the top of the first floor and materials have been chosen to better fit with the design facing Avenue Road, also reducing the massive look of the building. The owner agreed to pay cash-in-lieu to the city in return for not providing parking. The owner also committed to support SAHRA’s request that the parking cash-in-lieu be used to upgrade the Green P lot immediately adjacent to the site. The owner agreed to consider further reducing the height of the mechanical penthouse, if practicable. The owner agreed to consider the colour of material and/or finishes of the mechanical penthouse to reduce its visual prominence. The owner agreed to consider the colour of material and/or finishes on the third and fourth floors to reduce the visual intensity of these floors. The owner agreed to consider Introducing opaque or translucent panels on the second floor balcony at the rear as per the treatment of the fourth floor balcony. 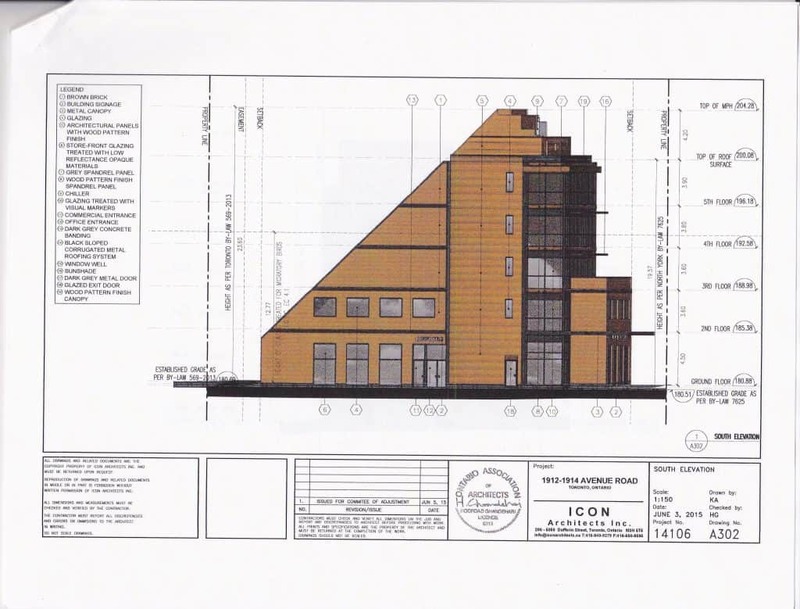 SAHRA believes that we have gained substantial improvements in the built-form/design of this building; that we ensured the allocation of funds to be applied to parking solutions on Avenue Road and that we will get By-law amendments in place to clarify intensions for future projects (which are now in place). What has this cost SAHRA? SAHRA retained a planner and a lawyer to prepare for the OMB hearing and to negotiate the Settlement with the owner. The costs are expected to be $14,000 in total. A fundraising campaign was initiated back in early November. The Board would like to thank all those who contributed both financially and with their time. To date, $6,750 has been raised, contributions by 77 individuals. As you can see, SAHRA’s expenses are well more than the monies received. Please consider donating to SAHRA by sending a cheque or online – please go to http://sahratoronto.com/membership/ to download and the Membership Form to accompany your cheque or to click on the Membership button if you wish to contribute via PayPal or a credit/debit card. The SAHRA Board feels that we have received good value for the services provided and that the money has been well-used in protecting the recommendations and intentions of the Avenue Road Avenue Study and the associated by-laws for this first precedent-setting development. Many thanks for your continuing support to SAHRA as we strive to ensure adherence to the Avenue Road Avenue Study guidelines for developments on Avenue Road! 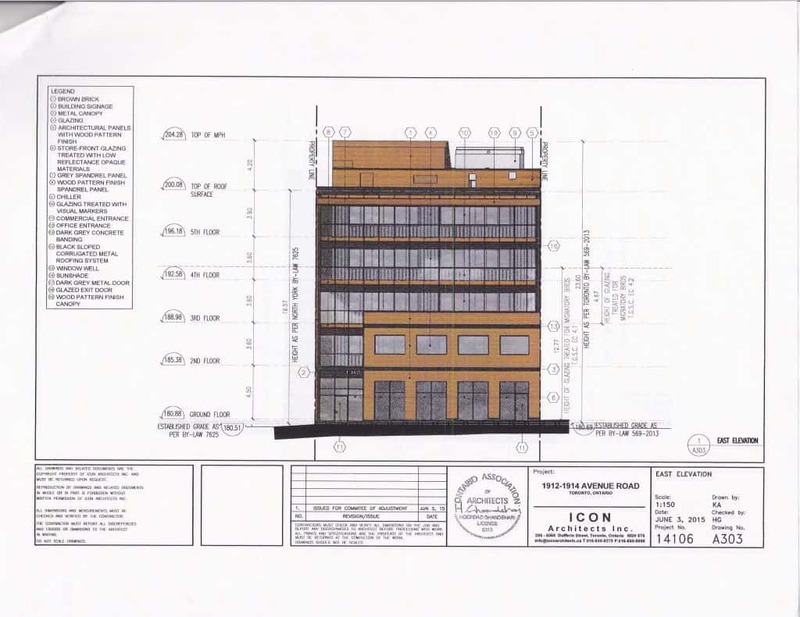 The developer for a proposed 5-storey knock down/replace building applied to the Committee of Adjustment (CofA) on Aug 6, 2015 for 15 variances for a totally commercial building. Loading spaces (would not be provided). As well, significant variances were requested for the built-form for height, rear setback, step-backs and gross floor area. Height – the maximum allowed is 5 storeys or 16.5m, excluding the mechanical penthouse. The mechanical penthouse must not be more than 2m. The developer asked for 19.4m (for the 5 storeys) plus another 4.2m for the mechanical for a total of 23.6m (versus the allowed 18.5m). Rear setback – the setback minimum is 7.5m from the rear lot line but the proposed setback is only 4.5m from the rear lot line. Step-backs – Step-backs are also required at the rear of the building to maintain a 45 degree angular plane – this is being done. 2m step-backs are required at the 3rd storey abutting Avenue Road (the developer has incorporated this step-back in the design) but they are not incorporating the step-back required on the side abutting Brooke Avenue. Gross Floor Area – the maximum gross floor area is 300% lot area, of which no more than 200% shall be used for commercial purposes. The proposed GFA is 368% of the lot area which is entirely for commercial purposes. The link can be found below for SAHRA’s submission to the CofA. It focused on the built-form variance requests is attached; the Old Orchard Grove Residents’ Association and other concerned residents also submitted letters opposing the built-form and other variance requests; we attended the Hearing on Aug 6, 2015 to present our objections. The developer claimed to have received letters of support from Planning, Councillor Carmichael Greb and Transportation. The CofA refused the application! Thanks to everyone who worked so hard, under such tight timelines, to submit their opinions to the CofA and/or to hang in (for 6 hours) to present to the CofA! We are dismayed that our Ward 16 Councillor would not support the Residents’ Associations and concerned residents in upholding the Avenue Road Study (2009) and the associated By-law changes, for the sake of some additional jobs at 1912-1914 Avenue Road. 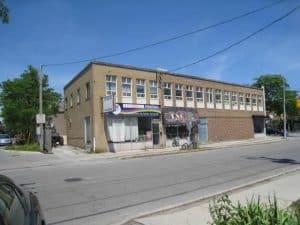 We are not opposing the strictly commercial use for this building and the additional jobs it would house but a totally commercial building should work within the built-form specifications and maximums as defined by the Avenue Road Study and the associated By-laws. Why did Planning allow an application this complex, with this many significant variances to go to CofA? This likely means we are going to have problems with every application that surfaces from hereon. We believe this issue is bigger than just Avenue Road and the Avenue Road Study – if approved it negates the principles of several studies related to the Avenues throughout the City that have been completed in the last 5-7 years! The residents of this area believed that the Avenue Road Study guiding principles and associated By-law changes would be enforced as the existing one to three storey buildings were redeveloped or renovated to the now-allowed 5-storeys. This building, as proposed, does not comply with a significant number of these very specific rules. The proposal should not be approved as it would make irrelevant years of time and money contributed by city planners, area residents and the Local Advisory Committee on developing the master plan for the Upper Avenue. If the by-laws are not applied to this instance of a 5-storey renovation/ development, all future developments on Avenue Road will ask for equivalent variances! 1912-1914 Avenue Road is the first, precedent setting 5-storey new build! We expected that the developer would submit an appeal to the OMB by Aug 26; they have done so and a 3-day Hearing has been scheduled to begin on Feb 24, 2016. SAHRA has applied for Party status at this Hearing and we have retained a Planner and a Lawyer to present our case at this hearing. We are now preparing our planning and legal arguments for the OMB Hearing. While there is obviously a great deal of passion surrounding the Avenue Rd Study, the day will only be won with dispassionate arguments based on existing bylaws. There are legitimate points we can use to win this case. We hope everyone will continue to share their ideas and thoughts so these arguments can be further refined and improved. Now on to the OMB!